Sepratech Corporation has a positive, natural, and rewarding corporate culture. We hold our personnel and client relationships as our most valuable assets. Sepratech is a company in the industrial water and wastewater treatment markets. 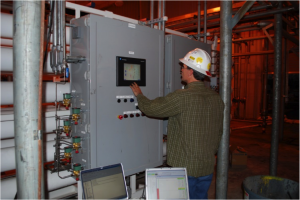 We service, sell, and rent process equipment: clarifiers, filters, ion exchange and membrane systems, and other make-up water, wastewater, and de-watering processes. The company also sells system components and consumables directly to our customers. We offer filter media, resins, membranes, nozzles, and internal piping arrays. These system components and consumable sales are also sold to our clientele as well as our core service business. Process real troubleshooting and solution-solving skills to make accurate repairs on the first outing. Suggest essential parts and repairs and practice company procedures to request needed parts. Efficiently manage time and resources. Build strong customer relationships through excellent communication and technical abilities. Obtain additional licenses and certifications as needed. Preserve company assets through the accountability of tools and inventory. Manage truck inventory and keep truck organized, maintained and clean. Ability to learn and use the company’s field management software. To apply for a position with Sepratech, please out the form below and attach your resume. Looking for a Career with Sepratech? Upload your Resume here.